NOTE As you read along, check the maps at the back of the chapter. The first commander in chief, Esek Hopkins, put the first squadron of the Continental Navy to sea in February 1776. Under the guns of the USS Providence and the USS Wasp and with the squadron headed by the USS Alfred, over 200 Sailors and Marines landed on New Providence Island in the Bahamas. 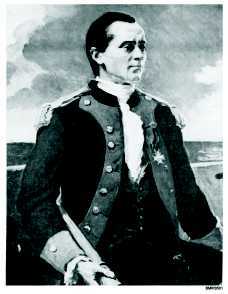 John Paul Jones served as first lieutenant aboard the USS Alfred. Hopkins raid on New Providence Island was the first amphibious operation carried out by the American Navy and Marines. The squadron captured a number of cannons and supplies from the fort. Because the British blockaded the American coast, it was difficult for the newly outfitted ships to reach the sea. The USS Montgomery and the USS Congress, ships of 28 and 24 guns, were built at Poughkeepsie, NY on the Hudson River. When the British occupied the port of New York, these ships were bottled up. To prevent their capture by the enemy, the U.S. government had to destroy them. Two more ships built in Philadelphia suffered a similar fate. Some of the others were also blockaded in their home ports, and one ship, the USS Trumbull, was bottled up for 3 years because it couldnt clear the sandbar in the Connecticut River. The new frigates of the Continental Navy had their moments. The USS Hancock and the USS Boston, both built in Massachusetts, set out together in mid-1777. They captured two British brigs and were then involved in separate actions with the British warships Somerset and Fox. After escaping from the Somerset on May 30, 1777, they met the Fox a week later and successfully captured it. Later, the two Continental ships were pursued by the powerful HMS Rainbow. Following a 39-hour pursuit, the Rainbow bore down on the USS Hancock and captured it. The USS Boston escaped and continued to serve in various actions over a period of some 3 years. Its last action was in the defense of the Charleston, South Carolina, harbor where it was captured by the British in May 1780. After its capture by the British, the Hancock went on to serve in the Revolution, but on the enemys side. By a twist of fate, it was the Hancock (renamed the Iris) that captured a sister frigate, the USS Trumbull, one of the original 13 frigates built for the Continental Navy. (The British crew was said to have called the American built ship one of the finest frigates in which it had sailed.) Among the names associated with this new made-in-America fleet of frigates are John Barry, who courageously commanded many ships; John Manley, who captured the Nancy while in Washingtons Navy; and Abraham Whipple. The skipper of the USS Providence, Whipple, was a member of a three-ship force that found itself on the edge of a huge, heavily guarded, enemy convoy off Newfoundland during a fog. Sending armed boarding parties to the merchant ships, the Americans managed to take 11 ships as prizes without being detected by the ships protecting the convoy. Cargoes and captured ships worth a million dollars were dispatched back to the States. John Paul Jones Among the most daring commanders bringing the war to British waters was John Paul Jones (fig. 5-1). As skipper of the USS Ranger, he left France on April 10, 1778, for raids against the British. After capturing a number of ships, he actually landed on British soil, raiding Whitehaven, England. 5-3 Student Notes: Figure 5-1.John Paul Jones, father of our highest naval traditions, represents the seaman, leader, officer, and gentleman at their best.